Accidental shelling by Russian occupation forces responsible for ecological situation in northern Crimea – Main Intelligence Dept. The Main Intelligence Directorate of the Ministry of Defense of Ukraine believes that the cause of chemical emissions in northern Crimea, occupied by Russia, was accidental shelling by Russian military units training in the area. The shells landed in so-called technological wastewater reservoirs, the directorate said. 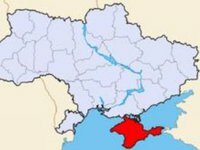 "According to the Main Intelligence Directorate of the Ministry of Defense of Ukraine, on August 13-19 this year, during military exercises along the administrative border with Kherson region, Russian military units fired shots in the areas where chemical waste from the titanium and soda factories were located. …This led to a significant deterioration of the ecological situation throughout the north of the occupied Crimea," Defense Ministry Spokesman Dmytro Hutsuliak said during a briefing on Wednesday. Hutsuliak said Russian occupation forces are trying to hide the scale of the environmental problem and avoid responsibility for causing it by disseminating false and distorted media reports designed to misinform society about the environmental dangers in Crimea.